If you browse the web on your Mac, you have surely heard of MacKeeper. Those ads placed all over the web through Google AdWords telling you to speed up your Mac are not some kind of scam at all. They are ads for MacKeeper. 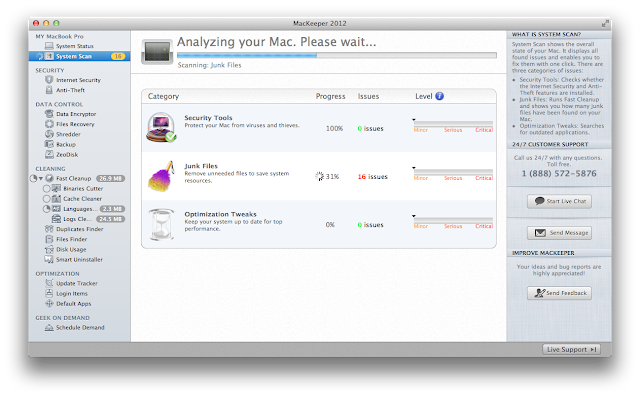 MacKeeper, by ZeoBIT, is an all-in-one maintenance and security tool for Apple computers running OS X. Here, I will review the 2012 version of MacKeeper and also dispel some of the myths and misunderstandings with this really good piece of software. Any particularly good points in the article are marked in green throughout and bad ones are marked in red. These colors are not used everywhere, but rather on aspects of the app that particularly stood out as good or bad. 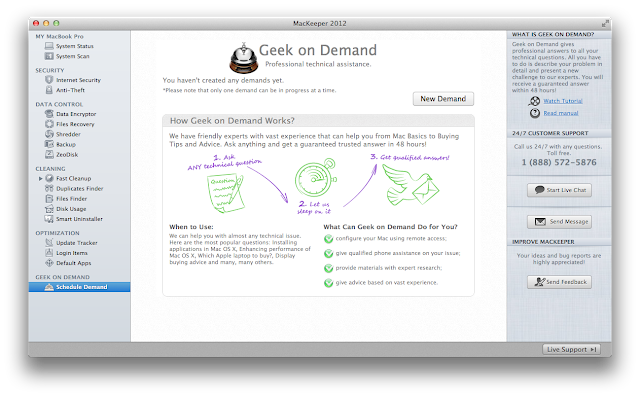 This program was tested out on a 2012 MacBook Pro 13-inch (with Core i7) running OS X Mountain Lion. ZeoBIT does very aggressive marketing for MacKeeper. There are ads all over the web and they look quite suspicious. Well, Windows users are always advised against clicking ads that claim to speed up your PC and then ask for money. MacKeeper does exactly that. But it's not a scam. MacKeeper costs $39.95 for a 1 computer license, $59.95 for 2 and $89.95 for 3. The 2 and 3 computer licenses come with some additional support options included. There are special discounts for organizations. The application supports OS X v10.5 and higher. They also have a (legit) 365 day money back guarantee and they have once claimed that they have a less than 3% refund rate. Some of the older versions apparently had annoying functionally, so don't trust some older reviews since the app has changed drastically. The MacKeeper interface is pretty straightforward and simple to navigate through. It looks a lot like iTunes, with various sections and features available from the left pane. It may feel quite overwhelming when you first open it. But don't worry, you'll get used to it quickly. MacKeeper looks really good. ZeoBIT seems to care a lot for eye-candy, which is awesome. Everything - from the website to the app itself - looks very impressive and attractive. When you open MacKeeper 2012, you will be greeted by a System Status screen. This is the first section from the left pane. This shows you a one-glance status of your Mac (as calculated by MacKeeper's System Scan, which is the second section in the pane). This looks like a race-car HUD. It shows you the condition of Junk, Security and Performance. Features are then divided into these sections. All of these are quite intuitive, but this organization coupled with the segregation into three sections in the System Settings made the interface quite overwhelming when I first opened the program. CCleaner - Basic junk cleaning, registry cleaning, program uninstallation (just because it opened quickly and allowed multiple deletions simultaneously). Soluto - Startup management that was more intuitive than msconfig. Auslogics Disk Defrag - Good defragmentation. Microsoft Security Essentials - Anti-malware. 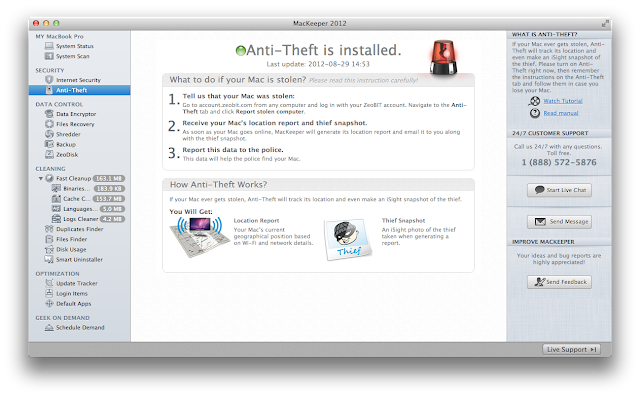 Now, MacKeeper does all of this for me. Additionally, it doesn’t even slow you computer down at all (at least in my experience). It just puts a small icon on your Menu Bar, which you can disable. MacKeeper has some non-maintenance features as well. First of all, there’s Internet Security. The anti-virus component of the app is not downloaded in the installation process. You can do so by going to the Internet Security section and enabling it. You have to wait through a 50 MB download or so. MacKeeper offers Real-Time Safe Browsing as well as a Real-Time Antivirus Scan. The latter doesn’t need to be enabled all the time, but rather only if you work with Windows emulators or something similar. Another security feature is Anti-Theft. You can just enable it and forget about it. If your Mac is stolen, you can go to account.zeobit.com and report your computer as stolen (you need a ZeoBIT account for this). Just hope that the thief connects your computer to the Internet without wiping it and you will get its location and the thief’s photos (using the in-built camera). This feature also works if you don't have MacKeeper running and you have hidden the icon from the menu bar. MacKeeper’s “Data Control” features are basically some hard drive security related items. There’s a Data Encryptor, which encrypts your hard drive with a key you provide. This will stop people from accessing your data from ‘behind the scenes’. For instance, no one will be able to boot up using a bootable Linux OS. There’s a File Recovery feature that attempts to recover files that have been recently deleted from the Trash. There’s also a Shredder feature that lets you “shred” sensitive data. It overwrites the data on the physical hard drive with random garble so that it cannot be recovered easily. There’s also a standard Backup feature. You simply select files to back up, select the number of copies to make and backup destinations. 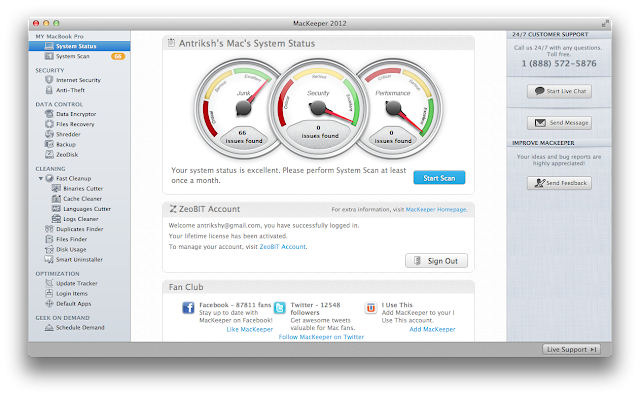 MacKeeper also has ZeoDisk, which seems to be a cross-platform cloud storage feature that is expected to release in Q3 of 2012. The first item under this category is Fast Cleanup. This is a collection of small maintenance features. Binaries Cutter clears unnecessary clutter that some apps may contain to support other platforms (like PowerPC). Cache cleaner does what it sounds like. It cleans the cache of many programs and not just your Internet browser. Languages Cutter deletes language data from your system that you’ll never use. You can safely do this. It will clear quite a bit of space and it’s very useful if you’re running too low. Logs Cleaner cleans “user log files” that are created for statistical purposes and can be safely removed. 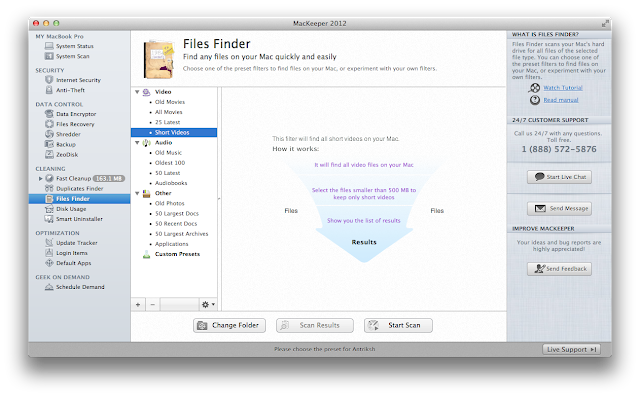 Another feature is a Duplicates Finder. This is indispensable if you frequently shuffle around multiple versions of files, lots of photos or if you are just having problems with Dropbox syncing (which I happen to be having right now). 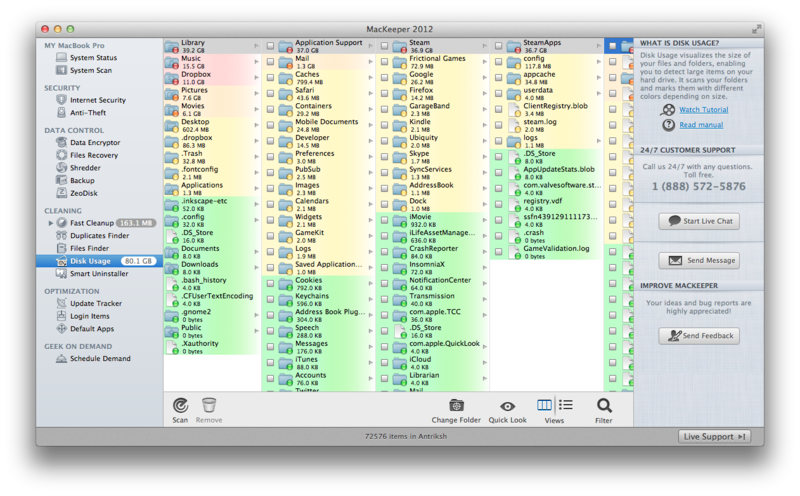 MacKeeper has a Files Finder feature, which I find really interesting. It lets you scan your enormous hard drive for stuff like the very recent 25 videos that you have added, 50 largest documents etc. See the screenshot below to get an idea. The Disk Usage feature scans your hard drive and shows what kind of data and which programs are using your space. And it looks really cool. Again, the screenshot speaks for a lot of words. Smart Uninstaller does what it sounds like, again. It removes programs along with its preferences, logs etc. Optimization features basically help you speed up your Mac in general. You will notice a difference if you use it on older hardware; especially a computer that you have been using for a while. Update Tracker lets you update apps that you have not installed from the App Store. In my experience, the updating was a hit or miss. I attempted to update InsomniaX, the utility that keeps your Mac awake when you close the lid. It seemed to pull a newer version from CNET’s Download.com and it failed. It may have been an issue with CNET. Maybe MacKeeper did not stay up-to-date with rapid changes in the website infrastructure. Login Items lets you disable programs from starting when you login - basically the same as the Startup tab in Windows’ msconfig utility and Soluto. With Default Apps, you can set default applications to open various file types. You can normally do this by right-clicking a file of a particular file type and clicking Get Info. But this MacKeeper feature just keeps things together. MacKeeper comes with support like I’ve really never seen before. Every single section of the app (in the left pane) comes with its video tutorial and manual entry on the MacKeeper website. When you select any feature from the pane, a sidebar on the right has links to the relevant online instructions and video tutorial. You also always have a button to start a live chat, to send a message or to send general feedback right there in the same sidebar. The chat feature is only available if you purchase the Standard license ($59.95 for up to 2 Macs) or higher, which is sort of ridiculous. There doesn’t appear to be a way to purchase a single license with live-chat included. ZeoBIT also has a 24-hour toll free support line for those who purchase a Premium license ($89.95 for up to 3 Macs). I tried starting a live chat just to check how long it takes for an agent to be assigned just for the purposes of this review. It took a few minutes and I got someone. I didn’t have a real problem and I explained that it was for a review. MacKeeper certainly has amazing support. Anyway, if you don’t get connected to a support agent, you can always send them a message. I didn’t try this out since I didn’t want to waste someone’s time for my silly review. This feature should be available to all MacKeeper customers since it’s included with the cheapest license. Another interesting real-person support feature in this app is the Geek on Demand feature (Schedule Demand) at the bottom of the left pane. It allows you to ask any question you have about OS X, what Mac to buy etc. and you get a guaranteed and trusted response within 48 hours. They can also configure your computer using remote access. I have not tried this one out either. Simply put, you get a lot from MacKeeper for the price of $39. It comes with features that span across multiple apps that could have cost you hundreds. 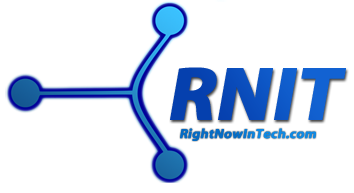 Additionally, there’s the incredible technical support that does not compare with what most multi-billion dollar companies offer even one bit. You should experience a huge difference in your Mac’s performance if you are on an older system that hasn’t really been cleaned using a third-party app. But it doesn’t hurt to keep your newly purchased computer well-maintained either. If you are a large corporation that has a lot of Macs - especially ones that many different people use - MacKeeper is an investment to consider. It will save you a lot of troubleshooting and time required for clean up in the future. You can try out MacKeeper 2012 for 15 days with their fully functional trial. This includes 24/7 chat as well. You can purchase the app from here. 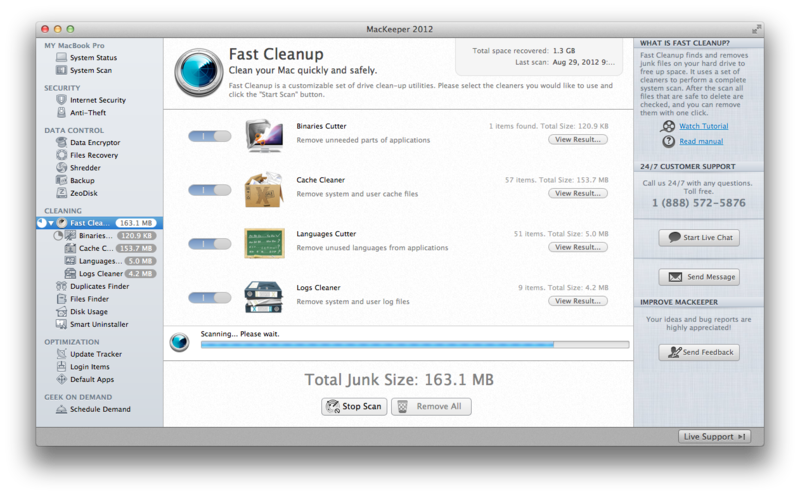 MacKeeper 2012 will be supported for a good while. They don’t make newer versions every year. So if you want to purchase a copy for yourself, now is not a bad time to do it. Besides, they’re still running the early-bird discount offer for users of MacKeeper 2009.